At the beginning of 2014, I started a path of healing my body using food. I cut caffeine, refined sugar, soy, dairy, gluten and processed foods from my diet to nourish my body to wellness. 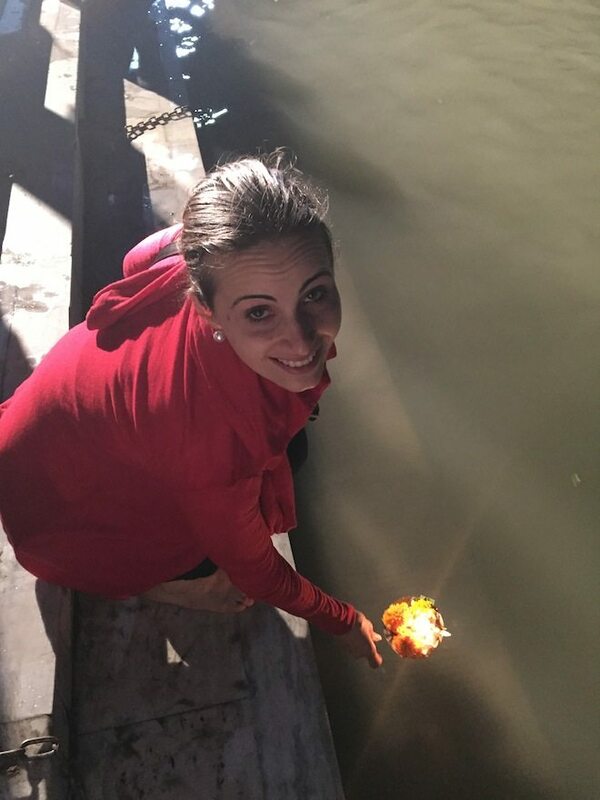 India had been calling me for some time so it seemed the natural next step in my journey to attend Stuart Watkin’s yoga retreat in Rishikesh, a town made famous when the Beatles visited the Maharishi Ashram in 1968 and brought Indian spirituality to the western world! Situated at the foothills of the Himalayas, the magic of Rishikesh attracts many on their spiritual journey and offers a pleasantly surprising range of vegetarian, vegan and allergy friendly options. There was even an organic store, Pundir General Store The Organic Store, a short walk from the Anand Prakash Ashram, where the retreat was held. My pilgrimage to India would not have been complete without an Ayurvedic consultation and cooking course. My cooking teacher, Surbhi has owned Ayurpak, an Ayurvedic café behind the Anand Prakash Ashram, with her husband Vishal for 9 years, when they moved to Rishekesh and built their home and café. At the time, Rishekesh was not the tourist mecca that it is today. It has always been known as heaven on earth. Their story is simple, yet has a lesson in it for us all – a simple life is one where home and the work place are one and the same. This means that you avoid the travel time involved in a city office and can work and rest as you feel. Unassumingly tucked in a garden behind a red gate, wood trimmings and traditional Indian artwork depicting countryside images (camels, palm trees) make this café feel warm and homely, reflecting the welcoming energy of its owners. Surbhi tells me that before starting the café, her husband worked as an engineer and was required to travel a lot, declining a posting that would see the couple move to Italy, he decided to set up a herb and oil store in Rishikesh. While working in the store, Surbhi noticed that many of the tourists would get sick from the rich Indian food. They would seek herbal and oil treatments, which is when she first started teaching foreigners about Ayurvedic eating, an ancient Indian tradition. “Ayu” means age and “vedic” refers to studies or education. “Food intelligence” is necessary for a happy life which centres around our digestive system. Positive digestive energy means a long life, nourished brain and fulfilled heart. Ayurvedic medicine is based around the three elements vitta (air), pitta (fire) and kaffa (lubrication). If one area becomes unbalanced, it results in disease so it is important to understand the food combinations and eat locally grown, seasonal food. More importantly it is important to be the doctor of your own body, including listening to what to eat and what not to eat, and knowing when to stop! (The theory of not over eating was described to me using an analogy of a coffee grinder, if you overload it, you have to press down for the beans to grind. This is the same as the digestive system which requires assistance if it is overloaded). Food is also eaten warm and prepared freshly and should not be eaten after six – eight hours after preparation as the nutrients are lost. 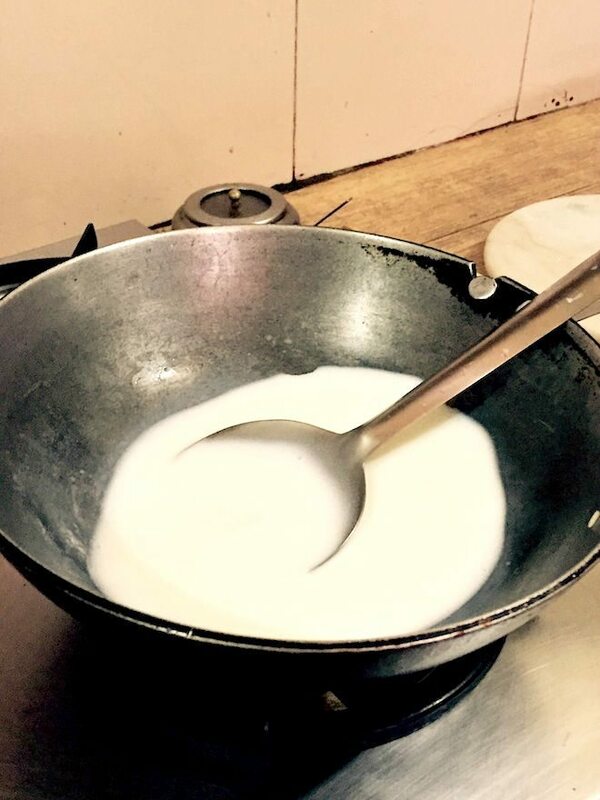 Khee, a sweet milky rice dish traditionally eaten before the main meal makes a delicious breakfast. Starting with the sweet, the first Ayurvedic course we prepared was Khee. 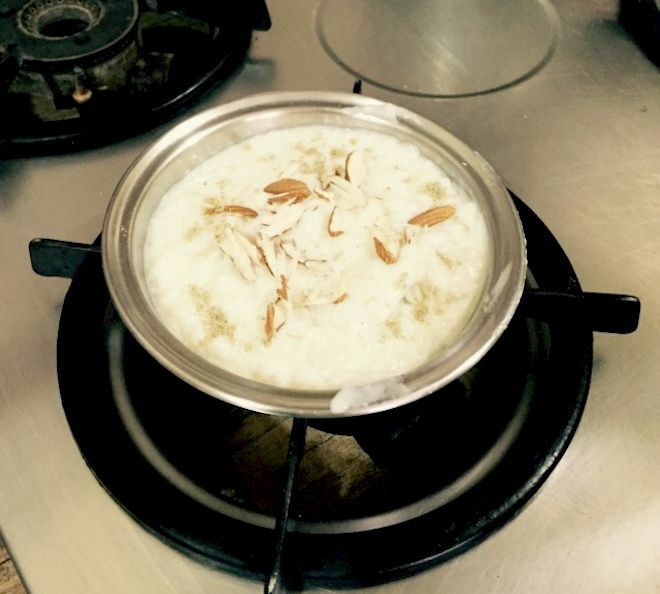 Creamy and cooling on the body (even though it is served warm) this meal of basmati rice, dairy milk and sugar dusted with cardamom and sliced almonds is a delicious dessert or breakfast! We used yellow lentils, which are medium density and perfect for a summertime dahl. For those who have wondered how to achieve a creamy consistency for dahl or questioned your waiter about adding dairy, the secret is cooking the dahl well in a pressure cooker then beating with a metal spoon and drizzling with ghee heated with cumin seeds. 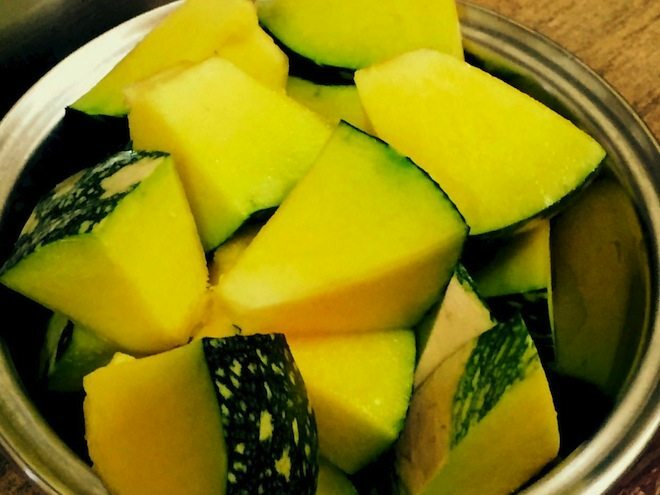 Summer pumpkin has green skin and so fresh that you can smell the sweet flavour. Tumeric, cinnamon, cardamom and coriander seed powder make this a taste sensation. Fennugreek seed, which is high pitta, is added to balance the pumpkin’s high vatta. 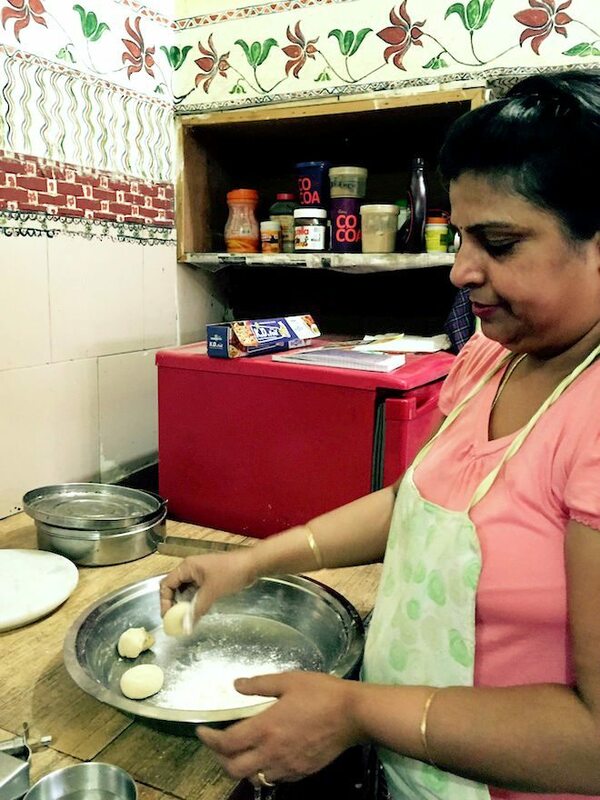 Who would have thought that chapati could be so simple to prepare? 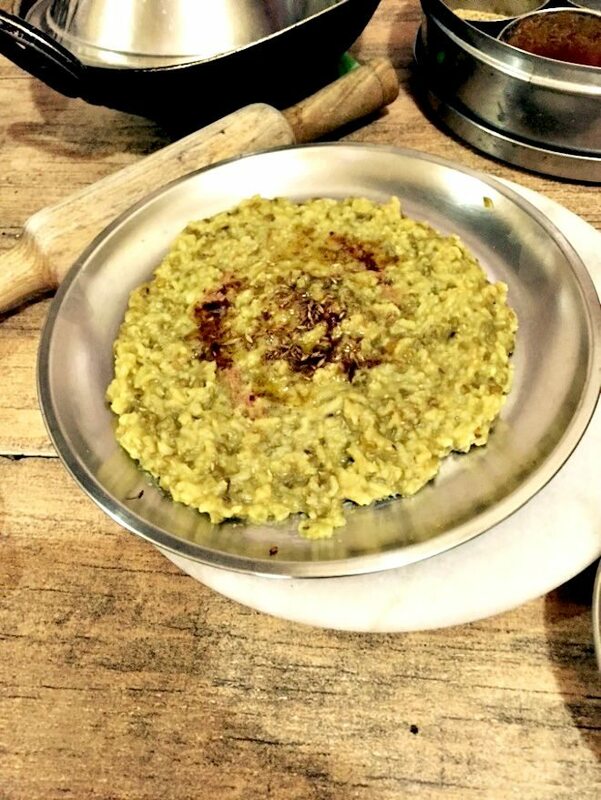 A dough of organic whole wheat, a handful for each chapati and water is rolled and placed on a hot plate then open gas fire and basted with ghee and served fresh! 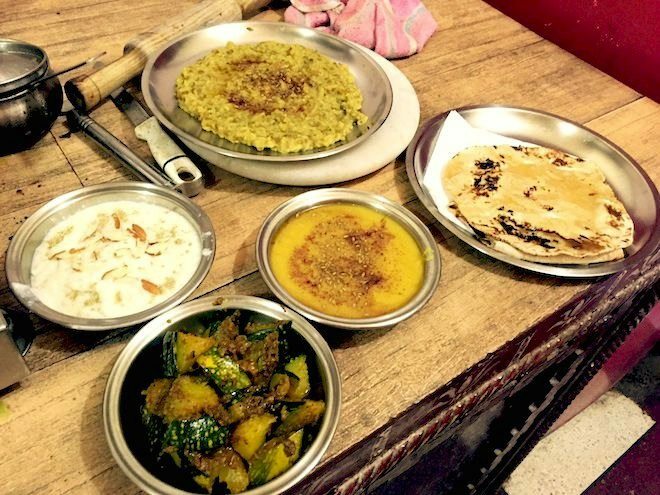 Dahl, pumpkin and chapati are usually served as one meal however today we also made kitchiri, mung dahl and rice, (above) usually a meal in itself! Food is essential fuel for any journey – whether spiritual journey into the self through yoga practice, a trek or travel to a far away land. Ayurvedic medicine is about healing not only by eating the correct foods for one’s dosha but our relationship with food. My Ayurvedic consultation in Rishikesh revealed that a balanced life for a pitta – kapha (like myself) includes dance, yoga, emotional wellness (healthy relationships) and infusing creativity and playfulness into work – I think there is something in that for everyone! I hope to join Stuart and Jo on their retreat to Kerala in 2016 to explore the town famous for Ayurveda. Cooking class cost: The cooking course was quite informal (as with most things in India!) – prices were in the menu at the restaurant. The price was about $20-$30 AUD for one person/3500 Indian rupiah and cheaper if more people do it. Cooking class contact details: Contact Vishal or Surbhi via email: ayurpak@yahoo.com, Facebook or their website. Words and images by guest contributor Belinda Coniglio. 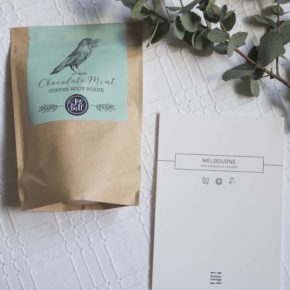 Belinda Coniglio is a lawyer, writer and strategist founding Ideas and Impact, a consultancy that focuses on strategic marketing and business growth. Belinda is also a University of Sydney Business School MBA student.